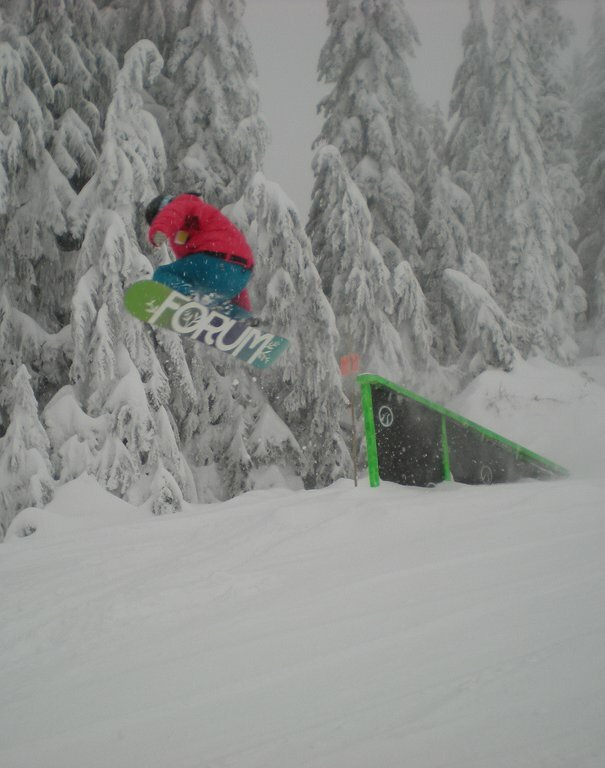 This past weekend, Grouse Mountain was invaded by MGT snowboard camps. The two day, all girls camp was full of good times and high fives, as well as hugs aplenty. The girls were stoked to ride regardless of their riding level and there was definitely progression to be seen. Camp got off to early morning start with registration and sign in before the sun even rose! Maybe it wasn't that bad, and with the low overcast conditions, the sun wasn't really rising on this dreary morning anyways. Due to road conditions and large line ups at the base of the mountain, some girls missed registration. The weather didn't get these girls down, though! Luckily, all of them brought goggles too. After splitting up into groups, the girls got ready to spend the morning going over the basics and some brush up over techniques needed to hit the park. I spent most of the morning session riding with Joanna's group. She was getting the girls comfortable with riding switch and getting their ollies dialed. After a few laps on the Cut, we decided to get into some freeriding. We headed off to the Olympic chair, slashing some pow lines and making the best of the ridiculous amounts of snow Grouse was getting. The girls practiced their technique on little drops and worked on their pop and, after a few laps to get familiar with the terrain, started trying spin tricks and grabs into the pow. Right before lunch, the camp hit a snag with some miscommunication and lost their lift privilages. Most groups decided that they would get the girls used to the joys of hiking features in the park instead of waiting in the Screaming Eagle lift line. After lunch, I set up in the park with Raewyn's group and snapped some shots of her campers and some coach/camper Kodak moments... but I used a Nikon Coolpix. The girls really pushing themselves, dialing in nosepresses, 180 ons, boardslides of all varieties and 270 outs. Leanne's group also hit up the park, focusing on the hip. She spent some time working with the campers on backside 180's. The girls were up for anything. No matter how hard they biffed, they'd get up, hike and try it again. There were a couple bails that would have had me rolling around for a while, but nothing could really get in the way of the eagerness these girls had to up their games. After spending some time on airing, Leanne had her group doing nose picks against the wall of the hip, just for fun. At the end of the day, the girls headed back to the chalet and said their goodbyes. Those who didn't have to leave right at 4:30 pm headed into the Theater in the Sky to watch a screening of the new Runway film called See What I See. There were also mini cupcakes that looked so dope, I almost felt guilty eating them. Soon after, I gathered my gear, took a few laps through the park and hit the road to rest up and get ready for day 2. As usual, I managed to sleep in through 4 alarms (yes, I have 4 alarm clocks placed in various corners of my room) and had to hustle to get to the mountain. Luckily, the roads were clear and the cloud coverage was high. I decided to grab a digital SLR for the afternoon, as visibility on the mountain was crystal clear. While in the rookie park, I met up with some guys who were over from Belgium to do some filming on the west coast. The riders hand shaped the hip to their liking and used it as a transfer into the untouched powder behind the feature. I spotted Robin's group riding the lift soon thereafter and decided to get some aerial shots of the park. Fortunately, MGT had worked out the kinks with line priority overnight and the campers got more ride out of their day. The morning park lappers were scarce, as a few of the groups had decided to head to the Olympic chair for some exquisite freeriding. I didn't get a chance to catch up with them, but heard they were able to get some while it was still fresh. Lesson to be learned here: Play in the powder with it's tracked before heading to the park. The campers and coaches then head into the chalet for some quick eats and hugs. They were joined by local Dragon Optics and Thirty Two Boots rep Dixon, who did a couple laps with the girls after lunch. If you're looking to score a limited ed Thirty Two Jacket...you're out of luck! Sometime between the time I walked into the chalet and the time I walked out, the weather had taken a turn for the worse, with high wind warning and super limited visibility. Regardless of the conditions, I trekked to the rookie park and set up my camera equipent by the box, hoping to get some decent shots, regardless of conditions. The camera was not digging the temperature and snow, so I quickly threw together a weather hood for the camera, as I hadn't prepared for the horrible conditions. For you budding photog's out there, here's how you go about it. You need to be set up on a tripod for this. You make sure you've got enough layers on, as you will need your jacket for this. Set up your camera on your tripod, wrap the jacket around the tripod and zip it up, draping the hood over the camera and lens. Most jackets have a zip off hood, with the fronts bottoned down. This is perfect as you can zip off the back and use it as a window to your viewfinder, cause we all know you rarely use the LCD screen to view your shots. Voila! Your lens is covered by your hood, but is not in the way, you have a full range of motion on your tripod as the jacket moves with the camera and if you have a flash, you just have to life the hood up a little to access it. If you wanna stay warm while doing this, grab a Session Stargyle softshell with built in mittens! Anyways, back to the event. I was able to get some neat-o shots. Soon after, MGT put on the Jump! Jib! Jam! The coaches called out a trick that you have to stick. The girl who did it with the most style and stuck it got a prize. The girls also had a little fun and wrapped up the event by putting out the call for the most original/creative/wowing/dirty trick. It was pretty dirty, for sure. Some of it was too hot for the internet, unfortunately. The day was quickly winding down and everyone headed into Lupin's for the wrap up. The girls entered their names into a draw and everyone went home with a draw prize. Among the loot was a brand spankin new Burton G Love, a pair of 32 boots, Dragon goggles, belts, travel hoodies, board bags, wallets and make up kits. The campers all had a good time and formed some tight friendships along the way. If all goes well, you may see a former MGT girl's crew lapping the park in the near future. I also ran into park volunteer James Fourty Four Anderson and his buddy in the lodge rocking some retro styles. Just a word of warning, the following picture contains some extremely good looking boys. You gotta have the skills to back up your style and you can find James in some of Charlie's edits. C-c-c-check it! After everything was wrapped up and Leanne and Raewyn were done with their artwork in Jenna's copy of the Snowboard Canada Women's Annual, we headed upstairs to the Observatory and had a few adult beverages such as hot chocolate and discussed some not so serious topics such as the future of genetic research, patterns of genetic inheritance and the real estate market. Needless to say, I had an amazingly fun time hanging out and riding with the MGT group. Despite some administrative hiccups, the camp went down pretty well, overall. Hopefully MGT will be back at Grouse Mountain in the near future for all you girls out there that missed out this year. Their next camp is in April, check the site for more details.